“Can you have respect and power? We (the HBJ) found that it’s hard to gain both”. In addition they said, “Decisions about high-level promotions most often center on perceptions of power, not of fairness”. Maybe so. I was given some feedback from an ex-employee of mine. In this constructive criticism he/she told me that at times when I would make a quick reactive decision it could come across as over-reactive. I know you are shocked. 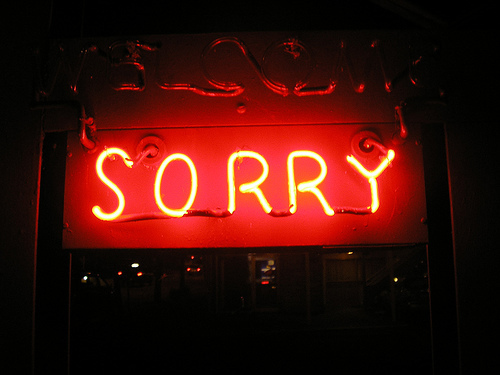 And I apologize. I typically think this is the right and fair thing to do. So get this. I got the drift from the feedback that this apology made me look weaker in the eyes of the recipient than if I did not apologize. By focusing more attention to the issue through the apology, I may have shot myself in the foot on the respect thing. The apology may have even appeared to make me look guilty of something. At least that is how the feedback came across to me. The scales tipped me over into the realm of Charlie Brown-ness. So I thought about it. I have decided I will continue to apologize if I do something wrong. It is simply the right thing to do. I will not over-apologize for little things. Take the good with the bad. I’ll forgo a promotion granted me by being a jerk. I’ll let someone else be the jerk. Trust is built if leaders admit faults. Building trust builds engagement. Engagement leads to organizational success. I’m happy admitting faults. Disclaimer: This is how I perceived the feedback. It doesn’t mean this was their intent (which is a whole other blogpost). I really want and need this kind of feedback. But good food for thought anyway. Experience has taught me that apologizing is kind of like forgiving yourself and the other person at the same time and doing so clears that space between you and increases the potential for growth. I’m with you Dawn, if relationships are the focal point of organizational success, then anything that enhances those relationships should be a positive and not a detractor. Great post, Dawn. Maybe my leadership compass is a bit off, but I think it takes a bigger/better leader to admit fault and apologize (when necessary) if they’ve done something wrong and/or offended someone. I can see how over-apologizing can take its toll on a leader’s persona, but doing the right thing must take precedence. I appreciate an appropriate apology, when someone really has screwed up. I don’t see it as weak. I see refusing to apologize when something really has gone wrong at my hands as weak. So I say I’m sorry sometimes, but now I temper it with other, more direct communications, when it’s not something to actually apologize for.